1. 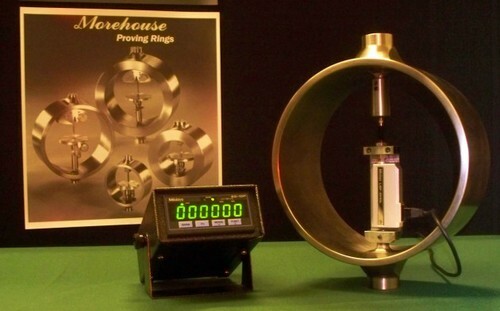 Exercise the Proving Ring and take readings to determine the tare load and record the Proving Ring temperature. 2. Calculate average no load reading for the tare load. 3. Determine net deflection for tare load. 4. Compensate net Ring deflection of tare load for temperature. - 0.075 div. Correction to 23 using the formula on page 17 of the Operation and Maintenance Instructions For Proving Rings manual. 5. Determine weight of tare load from computed load table. 6. Exercise the Proving Ring and take readings for the applied load. 7. Calculate average no load reading for the applied load. 8. Determine net deflection for applied load including the tare load. 9. Compensate net Ring deflection of load for temperature. TCM = - 1006.645 div.